The Dream takes luxury and adds attitude along with a true 500 pound capacity! With big wheels and a motorcycle styling, comfort and pizzazz abound. The Dream is for those staying on property at Universal Orlando, or those at a Disney World resort where you will commute using the boats and/or monorails. The Dream is named that because it indeed handles like a Dream. 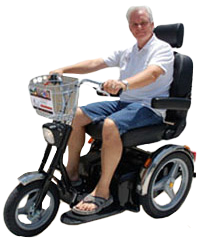 It has the industry largest wheel size making it the most maneuverable and a very smooth ride. It handles up to a 500 pound weight capacity and has THE LARGEST BATTERIES AVAILABLE! This model is a European model and is a hand drive. To move forward you squeeze with your hand, pulling the lever towards your palm with your fingers (rather than pushing with your thumb). It comes with a large front basket and has a headlight for your nighttime driving. This top end luxury model with captain’s seat and large weight capacity will provide you your full 12-15+ hour theme park daily ride time. And with our upgraded fast battery charger (no additional cost to you of course) you can charge the Dream in 8 hours from dead flat. We always recommend you bring your charger with you to the theme park just in case you have more fun scooting around than riding the rides and you can always get some added re-charge if you plug in while you are at lunch or dinner if you desire. The Dream has it’s own key on a coil wristband for easy keeping. If you want style with attitude, luxury, and the largest battery capacity and/or weight capacity (up to 500 lbs) The Dream is for you. Rent the Dream and you will make many a new friend as they just can’t keep from commenting on your great-ride! You can access all Universal Orlando attractions from their on-property resorts via direct riding access and there is also boat transportation for most resorts. Resorts that have direct access to the Monorail which can take you to Magic Kingdom or EPCOT are The Contemporary, Bay Lake Towers, Grand Floridian and Polynesian. Resorts that have direct riding access and boat transportation to EPCOT and Hollywood Studios are The Dolphin, Swan, Yacht Club, Beach Club and Boardwalk Inn.